Viewers weren’t excited by the return of THE MILLERS. CBS: THE MILLERS returned for the fall and did exactly what it did last season: lost half its THE BIG BANG THEORY lead-in (4.4, down 0.1 from last week)–and perhaps more, since MILLERS started at 8;31PM, so its rating may be adjusted this afternoon. (It was also down 0.6 from the BIG BANG rerun that ran at 8:30PM last week.) The show’s real challenge will come next week, when it trades BIG BANG for a 2 BROKE GIRLS lead-in that may be considerably lower. CBS could be pleased with the performance of SCORPION, which remained at 2.4 despite the lower lead-in, and was up from MILLERS. NCIS: LA was up 0.1 to 1.7. CW: JANE THE VIRGIN’s sophomore episode was actually up 0.1 from its premiere (to 0.7), something that rarely happens in a show’s second week, and which suggests strong word of mouth. 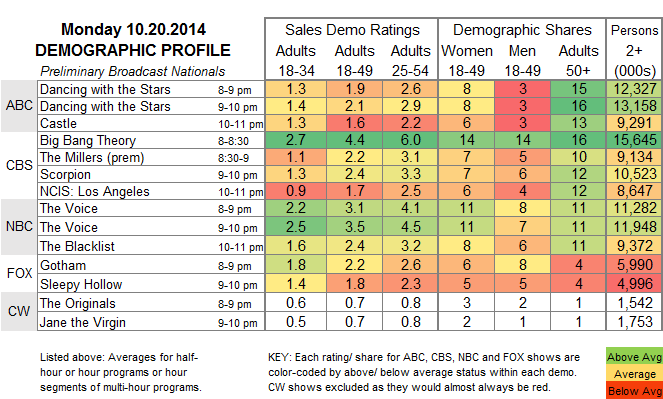 THE ORIGINALS was steady at 0.7. FOX: GOTHAM fell 0.2 to a new low 2.2, still a fine number but raising the possibility that non-genre fans are starting to tire of its concept. SLEEPY HOLLOW was up 0.1 to 1.8. NBC: Not a great night, as THE VOICE fell 0.7 to 3.3, and THE BLACKLIST dropped 0.4 to 2.4. ABC: DANCING WITH THE STARS was stable at 2.0, but CASTLE was down 0.3 to 1.6. THE WORLD SERIES makes its annual interruption of FOX’s fall schedule tonight, something that’s been irritating in past seasons, but may come as a relief to the network this year. Last year’s Game 1, which aired on a Wednesday, had a preliminary 4.1 rating that adjusted up to 4.3. CABLE RATINGS: Come back this afternoon for detailed demographic ratings for top cable programs from this night.